When Jaime (our baby boy) was born in August, 2007, one of the first things that everyone commented on, was his thick and lush eyelashes. 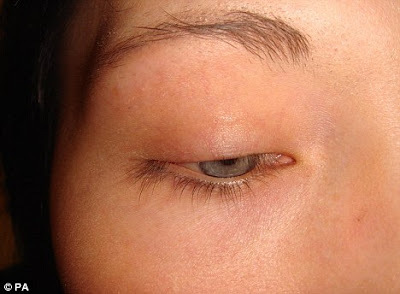 To many people, the length or thickness of one's eyelashes is not actually a very remarkable feature, however to many Chinese (my wife included), the eyelashes (and 'build' of the eyes in general... that is, single or double eyelids) is very important. Jaime definitely inherited his eye colour from his Mum's side of the family, but his eyelids and eyelashes came from the other side of the gene pool. As he's grown, his eyelashes have thickened and lengthened exponentially, and it's one of the first things people comment on when they see him (along with his (still very chubby) cheeks. In the latest in cosmetic surgery breakthroughs in the United Kingdom, surgeons have performed Britain's first ever "eyelash transplant". The hair from the back of the head has been grafted onto the eyelid. The patient, 19yo Louise Thomas, had the treatment due to an obsessive disorder - plucking or pulling out the hair, also known as "trichotillomania". The operation took four hours, and involved taking hair from the back of her head and then transplanting individual hairs into cuts in her eyelid, this giving her long thick lashes. 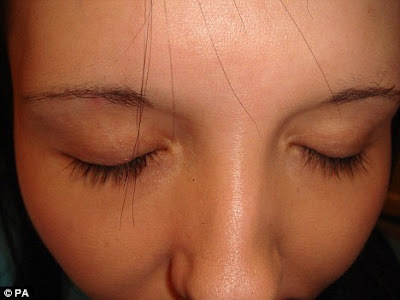 The procedure, which was pioneered in the US, cost about £3,500 and over time her lashes will thicken up naturally. Ms Thomas said, "Having suffered from trichotillomania for 17 years, I learned to accept that I'd never have real lashes again. That's quite a hard issue for a young girl to come to terms with". According to the company that performed the surgery, "...the eyelash transplant procedure is a very safe, cost-effective and pain-free treatment that can have life-changing effects". can we do it in singapore?